As part of my ongoing research on a historical novel I want to write set in the 1930s and 40s, I bought this book on the Battle of Iwo Jima. My father was there as a radioman and gunner on a landing craft, and I had known some basic information about the battle, but this book did a good job of filling in the gaps. Further, Wheeler does a thorough job of including the visceral details that add both incredible realism and admiration for those who experienced this battle. 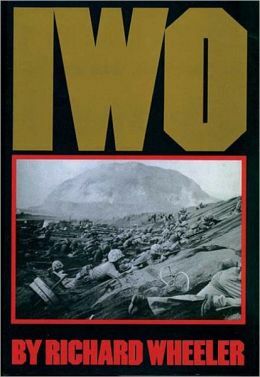 A wounded veteran of Iwo Jima himself, Wheeler did comprehensive interviewing as part of the background research for this book. He also interviewed Japanese survivors and got access to letters written by notable Japanese soldiers such as General Tadamichi Kuribayashi, the architect of the defenses on Iwo and commander of forces there. Having the Japanese perspective added greatly to the telling of the story. This is not fiction; this was a nonfiction retelling of the story. There was substantial detail in the recounting of many individual incidents. The only downside of the story was that it was encyclopedic in approach. Whether it was the chosen approach of the author or his writing style, the story never got personal. Perhaps if it had gotten too personal, the numerous anecdotes would have suffered somehow. Unfortunately, I found the writing stiff and formal, more like a textbook than narrative. The information and individual incidents were extensive, visceral and incredible. Wheeler writes in one place of a Marine who suffered injuries from five artillery shells, one after the other, but remarkable survived them, albeit with major injuries. He also goes into detail as to which units were involved in which assaults and who took the most damage, include Easy Company’s assault on Mount Surabachi and the famous hoisting of American colors on that mountain. The book is fascinating in information, but I thought bland in the telling. I give it 3 1/2 stars out of 5.